The work Kitka River is part of the cycle Museum of Nature (2003-2008). 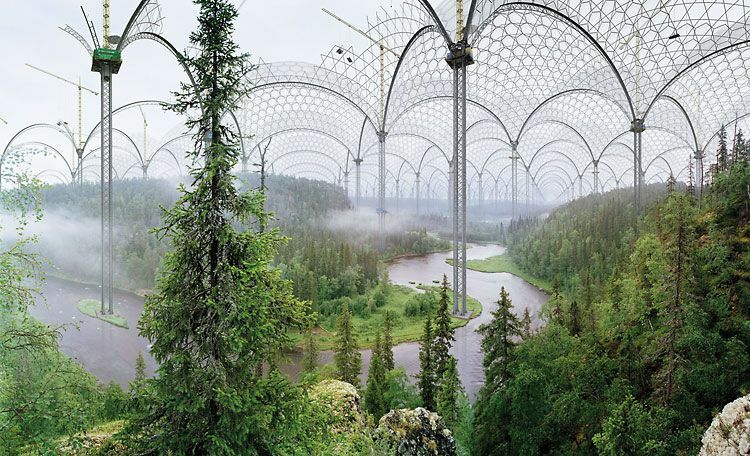 Museum of Nature turns whole Finnish landscapes into installations for experiencing nature. Specifically chosen nature sites and landscapes are prepared for the human spectator. Here nature is put on hold and turned into something completely artificial. Very much like with some national park programs where we attempt to preserve nature in its primordial form, which are small, disconnected, and isolated islands for the entertainment of the human spectator. Ilkka Halso (FI) is dealing with the representation of nature and practices of science illustration. His media have turned towards landscape, photography and architectural installations. He is interested in how in our culture nature is observed through the looking glass of science, rationalism and consumerism. In the course of time his work in search of true nature has shifted more towards finding the unnatural essence of nature.